The School of Science and Technology at the University of Northampton have been working with local schools to create robots made from junk. This is an initiative by the University to introduce environmental sustainability, engineering and computing to students and has been been funded by Northampton Enterprise Limited and east midlands development agency (emda). (a)Session 1: Introduction to waste management, its impact, recycling and reuse. An introduction to the idea of making robots from rubbish. (b)Two sessions involving guided exercises. · Session 2: Involves some problem-solving exercises (approx. 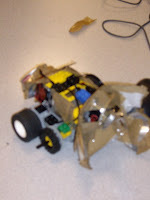 ½ hour), then in groups investigate adding ‘junk’ with a new electrical components such as batteries and motors to use vibrations to move the robots. · Session 3: To apply some of the ideas on problem solving and use of materials developed previously to build a little junk-clearing robot. The facilitators will help with programming the robots and the instructions to be used. (c) The final session will involve the students, with the help of the facilitators, demonstrating and presenting their group’s solutions. a. Each group will present their work to the other groups in a way they feel is most appropriate- with facilitators help if needed. b. An hour tinkering time before the presentation will be given to solve any last minute problems. The project aims to provide an opportunity for year 9 or 10 pupils to meet a range of people working or training in STEM subjects; the selection of the facilitators aims to have diverse mix of ethnicity to attempt to dispel stereotypes of scientists and engineers. Details can be found at the project site including some example exercises. Brooke Weston video – I love the music on this one! Moulton School presentations – Some very interesting presentations.